Montrezl Harrell’s dunk gave the Clippers that many points near the end of the third quarter and they went on to beat the Utah Jazz 143-137 in overtime. “I love you people,” he told the crowd that gave him a standing ovation during a halftime ceremony. Team owner Steve Ballmer donned the same black-and-white “Thank you Ralph!” T-shirt over a long-sleeved shirt. “This is a night the likes of which I could never have possibly imagined,” he said. 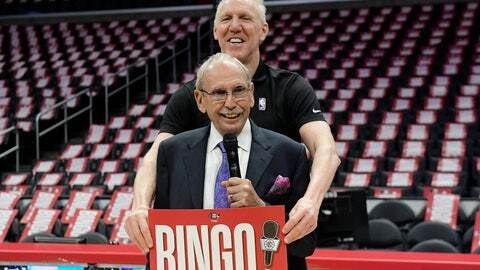 The Clippers made 12 3-pointers, with fans holding up placards reading “Bingo” and shouting it out on each one. He’s one of a few announcers who have called games in the four major U.S. pro leagues: the NFL’s Chargers, MLB’s Philadelphia Phillies, NHL’s Philadelphia Flyers and NBA’s Clippers and Philadelphia 76ers. He’s received a star on the Hollywood Walk of Fame and three Emmy Awards. Lawler met his wife, Jo, after leaving Philadelphia for San Diego to call Clippers’ games and she was a season ticketholder. The Clippers announced the creation of a scholarship in Lawler’s name at his alma mater, Bradley University in his hometown of Peoria, Illinois.